What colours does Fustic extract produce? How do I use Fustic extract? 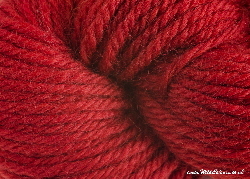 How much wool does Fustic extract dye? Fustic or Old Fustic (Maclura tinctoria) is a medium to large tree originally found in the forests of Brazil and the West Indies. The dye comes from the heartwood of the tree. More on New (or Young) Fustic and Old Fustic here. 2) What colours does Fustic extract produce? Fustic extract produces warm yellows. 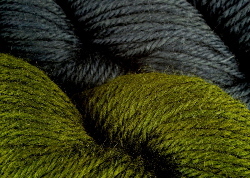 Over dye it with indigo for dark green and for dark blue (phthalo) green (see 2nd photo). Over dye fustic with logwood and iron for blacks. 3) How do I use Fustic extract? Make a paste with 1 teaspoon (5 grams) fustic extract and a small amount of warm water. Fill a saucepan with water and add the fustic extract paste. Add the pre-wetted mordanted fibre. Bring the dye bath to a gentle simmer and then keep at that temperature for 45 to 60 minutes, stirring gently from time to time. Leave overnight to cool. 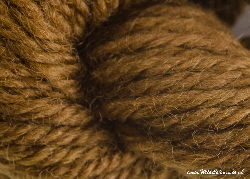 4) How much wool does Fustic extract dye? 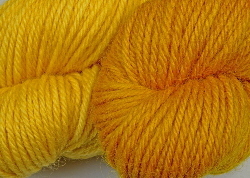 20 grams of fustic extract will dye two 100 gram hanks of Blue-faced Leicester superwash wool to a strong orange yellow and a light yellow, respectively, depending on water quality and other factors (see top photo). 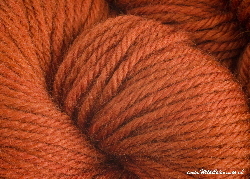 We suggest you experiment as dye colours will vary with the type of fibre, the mordant and the quality of water. 5) What is Fustic extract? Our Fustic extract is shipped as a weathered sandstone coloured crystalline powder that is very stable and of high colour fastness. It is produced using processes that respect the environment.